In a mixing bowl, mix together buttermilk, besan, turmeric and chilli powder. Heat oil in big pan, add the crushed garlic and fry for a few mins till it becomes light brown. Add the Five spice (Panch Phoran), Asafoetida and curry leaves. Pour the buttermilk mix into the spices and boil for 3-5 mins. Add salt to taste. NOTE : In Summers, another tasty variation is cold masala butter milk. It is a refreshing drink and absolutely zero calories, so it is a tasty alternative to sodas and sweet drinks. Put all the ingredients in a blender till coriander and mint leaves crush very well. Serve cold. 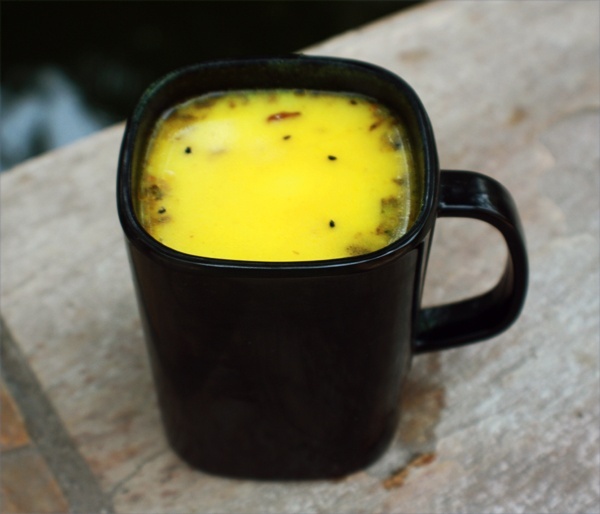 This entry was posted in Drinks, Grand Ma's Recipes and tagged buttermilk, Yogurt by Kamakshi. Bookmark the permalink.